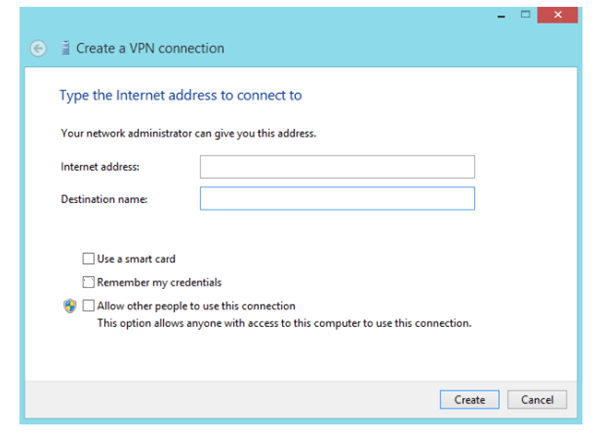 This instruction is for users who prefer to setup VPN on WINDOWS 8 & RT manually. 1. Pull up the charm menu by swiping leftward from the right side of the screen. 2. 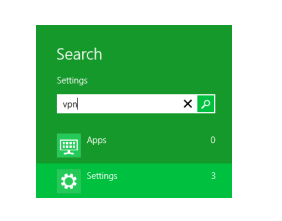 Type VPN in Settings, and then click "Set up a virtual private network (VPN) connection". 3. Input "Server Address" provided by FlyVPN. Log in on web and access VPN server address page to check server address, users should register an account to check server address on this page. 4. Input the server name as "Destination name". 5. Input your FlyVPN username and password and click "Create", but If you haven't upgrade to premium account, please input free trial VPN account and password. Then "Connect". 6. Open the search charm again as described in the first step. 7. Select the Settings charm and select Internet access or Network. 8. Select the VPN you created just now and click Connect. 9. Enter your username and password, then click OK.